Although 2,000-calorie diets often lead to weight loss in men, some men do require 2,000 calories a day to maintain a healthy body weight. The number of calories a man should consume daily depends on his age, his size, his activity level and his weight-management goals. Following a daily 2,000-calorie meal plan will likely help you achieve your weight-loss goals. According to the Dietary Guidelines for Americans 2010, sedentary men over age 60 often need 2,000 calories daily to maintain a healthy body weight. However, sedentary men and moderately active men 60 and younger need at least 2,200 calories a day for healthy weight maintenance. 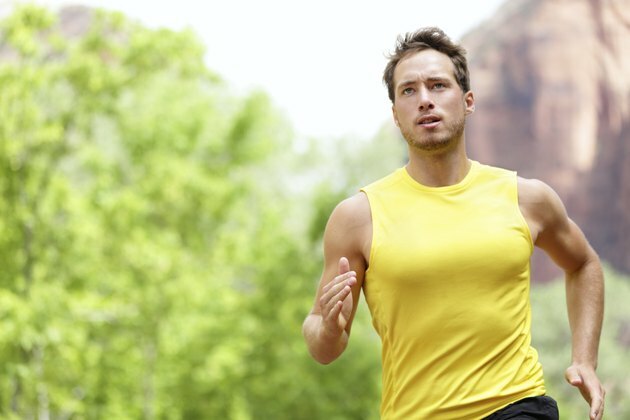 Active men ages 19 to 35 need as many as 3,000 calories a day to maintain their body weight. Therefore, many men who consume 2,000 calories a day will start to lose weight. If a 2,000-calorie diet is appropriate for you, using a meal plan will help you stay within your daily allowance of calories. According to the 2010 Dietary Guidelines, a daily 2,000-calorie healthy meal plan includes 6 ounces of grains, 5.5 ounces of protein foods, 3 cups of dairy foods, 6 teaspoons of oils, 2.5 cups of vegetables, 2 cups of fruits and 258 extra calories from foods that you choose. Select whole grains when possible, and avoid sweets, added sugars and high-fat meats. For breakfast, try two slices of whole-grain toast, 1 tablespoon of peanut butter, four egg whites, one small orange and 1 cup of low-fat Greek yogurt. A mid-morning snack might consist of 1.5 ounces of reduced-fat cheese and 1 cup of blueberries. 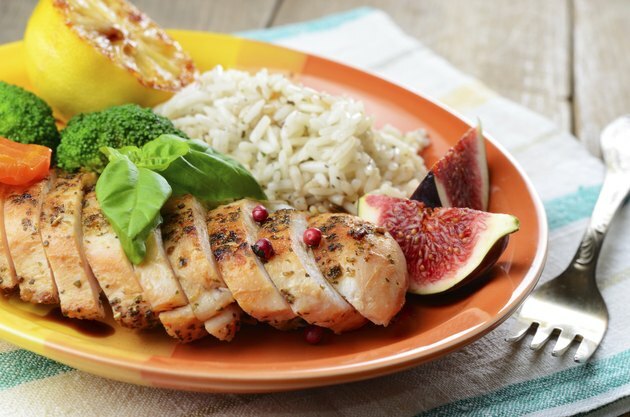 For lunch, opt for 2.5 ounces of grilled chicken breast, 1 cup of brown rice and 1.25 cups of cooked broccoli. A good choice for a healthy afternoon snack is two-thirds of an ounce of sunflower seeds and 2 cups of low-fat cottage cheese. For dinner, have 2.5 ounces of cooked lean beef; 1.25 cups of sautéed mushrooms, onions and peppers; 2 teaspoons of olive oil; and 1 cup of whole-wheat pasta. Start your day with a healthy breakfast of 2 cups of whole-grain cereal, 1.5 cups of low-fat milk, one small banana and two-thirds of an ounce of almonds. For a morning snack, opt for 1 cup of low-fat cottage cheese and 1 cup of strawberries. 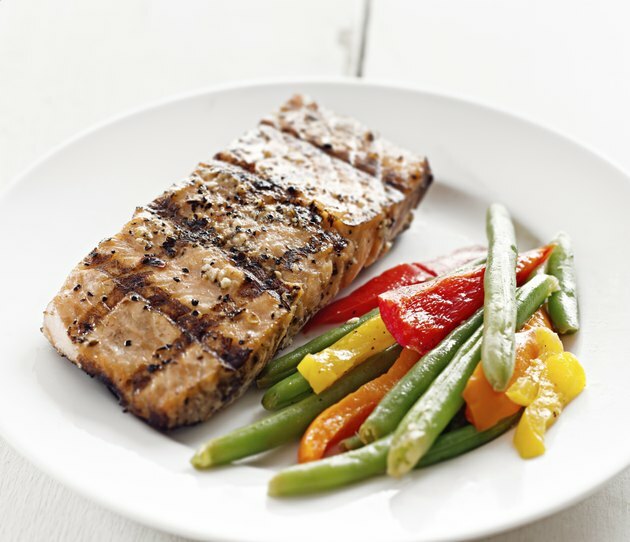 A healthy lunch might consist of 3 ounces of grilled salmon, 1 cup of quinoa and 1.5 cups of cooked zucchini. 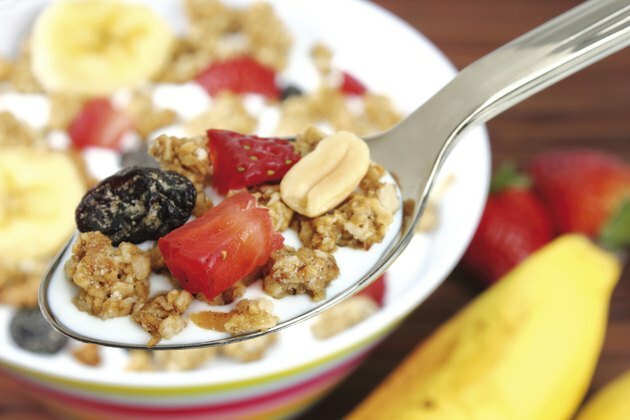 For an afternoon snack, have two-thirds of an ounce of mixed nuts and 1 cup of low-fat yogurt. A healthy dinner could include a turkey burger on a whole-grain bun, 2 cups of mixed greens and 2 tablespoons of Italian salad dressing.